The problem was the down jacket, recalled David Glasser, PA-C, adjunct instructor of physician assistant (PA) studies at the George Washington University School of Medicine and Health Sciences (SMHS). Glasser, who joined the New York City Fire Department as a paramedic before 9/11, had made the switch to PA and was working in the emergency department (ED) of a local hospital. A young surgical intern, known as “Intern Steve,” however, uttered the fateful word and jinxed the entire shift. Within minutes, a 22-year-old male with stab wounds to the chest was rushed into the ED. They alerted the surgical team – a “Plan Blue” – and after arriving in Operating Room Two, Glasser noticed that one of the patient’s arms was still inside his puffy down jacket. Intern Steve grabbed a pair of surgical scissors to slice through the sleeve and assess any wounds. For the PA students in the audience, Glasser’s talk – comforting advice from years spent in the field – was a fitting end for their classroom-based education and the beginning of their clinical careers. What’s key, he counseled, is listening to patients, parents, and providers, and relying on the foundation of knowledge they’ve built while at SMHS. Keeping up with medical advancements, such as personalized care and genomics, he added, is also critical, particularly with the ever-evolving world of evidence-based medicine. “And lastly, and most importantly, do not cut the down jacket,” Glasser said. The audience laughed, students clapped, and Glasser departed the stage, his words, like those of student speaker Christopher Vaudo, lingering over the graduating class of 2018. Vaudo, who got his start in health care before beginning PA school with stints at clinics in Alaska and Africa (where he learned Swahili and climbed Mount Kilimanjaro), was selected by the PA faculty as the recipient of the Physician Assistant Outstanding Student Award. 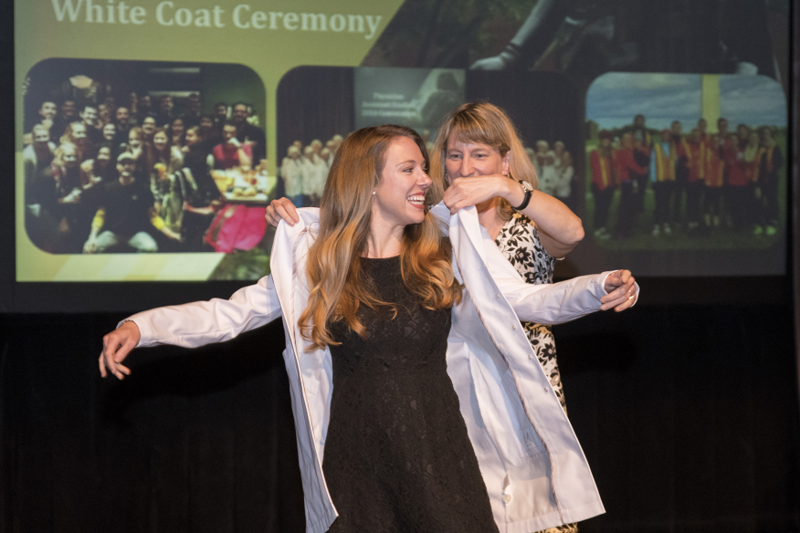 The white coats, she added, are also part of a tradition of paying it forward; alumni of the PA program, including members of the PA Class of 2017 who were encouraged to participate through a match challenge proposed by classmate Sean Yu, PA ’17, donated the funds for the coats. Following Alexander’s address, the Class of 2018, with help from faculty, crossed the stage of the Dorothy Betts Marvin Theatre and officially donned their white coats before reciting the Physician Assistant Oath. To a standing ovation, they filed out of the theater, leaving their days as pupils behind.